Parents can feel comfortable knowing their child is protected by a fully-enclosed spring that prevents the child from touching the spring. Cleaning instructions: Machine wash seat - cold water, delicate cycle, line dry. "Bounce bounce bounce, bounce bounce bounce," might be the lyrics to your favorite party song, but soon it's all your little babe is going to be doing in their Evenflo Johnny Jump Up Doorway Jumper. While you're cooking up your new subscription box recipe or binging the latest hot show, your tiny tot will be bouncing and giggling away in this fun jumper. The Bumbly Evenflo Johnny Jump Up doorway jumper stimulates baby through jumping fun. You'll feel comfortable knowing that your child is protected by a fully enclosed spring that prevents him from touching the active spring. Age: 4 - 12 months. Fully enclosed spring prevents child's fingers from touching while also preventing dirt from collecting in the active spring. Jumping promotes fun and healthy activity for baby. Features Fits standard doorways that are 3 to 6" thick with firmly affixed door trim at least ½"wide. 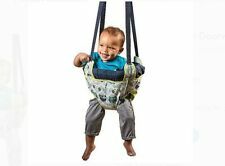 The Owl Evenflo Johnny Jump Up doorway jumper stimulates baby through jumping fun. You'll feel comfortable knowing that your child is protected by a fully enclosed spring that prevents him from touching the active spring. Cleaning instructions: Machine wash seat - cold water, delicate cycle, line dry. Wipe other parts with mild soap and water. Do not use harsh detergents or bleach. Fully enclosed spring. Parents can feel comfortable knowing their child is protected by a fully-enclosed spring that prevents the child from touching the spring. Evenflo Exersaucer Door Jumper, Owl. Color - Owl. Fully enclosed spring. This doorway jumper stimulates baby through jumping fun. Parents can feel comfortable knowing their child is protected by a fully-enclosed spring that prevents the child from touching the spring. Fully enclosed spring prevents child's fingers from touching while also preventing dirt from collecting in the active spring. Evenflo Exersaucer Door Jumper, Marianna. Color - Marianna. Parents can feel comfortable knowing their child is protected by a fully-enclosed spring that prevents the child from touching the spring. Fully enclosed spring. Parents can feel comfortable knowing their child is protected by a fully-enclosed spring that prevents the child from touching the spring. Fully enclosed spring. You can stop searching! Parents can feel comfortable knowing their child is protected by a fully-enclosed spring that prevents the child from touching the spring. By Evenflo. Cleaning instructions: Machine wash seat - cold water, delicate cycle, line dry. Evenflo Exersaucer Door Jumper, Marianna. Parents can feel comfortable knowing their child is protected by a fully-enclosed spring that prevents the child from touching the spring. Portable;Gender:Girls. Parents can feel comfortable knowing their child is protected by a fully-enclosed spring that prevents the child from touching the spring. Evenflo Exersaucer Door Jumper, Owl. Cleaning instructions: Machine wash seat - cold water, delicate cycle, line dry. I WILL work with you to resolve any problem you may have. A: 4 - 12 months. Fully enclosed sp prevents child's finrs from touching while also preventing dirt from collecting in the active sp. It will not include any adapter or converter for any country. Jumping promotes fun and healthy activity for baby. This doorway jumper stimulates baby through jumping fun. Parents can feel comfortable knowing their child is protected by a fully enclosed spring that prevents the child from touching the spring. Age: 4 - 12 months. This doorway jumper stimulates baby through jumping fun. Parents can feel comfortable knowing their child is protected by a fully-enclosed spring that prevents the child from touching the spring. Doorway Jumper, Owl. Parents can feel comfortable knowing their child is protected by a fully-enclosed spring that prevents the child from touching the spring. Have a Problem?. 100% Manufactures Warranty. Cleaning instructions: Machine wash seat - cold water, delicate cycle, line dry. Wipe other parts with mild soap and water. Parents can feel comfortable knowing their child is protected by a fully-enclosed spring that prevents the child from touching the spring. This doorway jumper stimulates baby through jumping fun. It provides entertainment and exercise for baby without taking up all your floor space. The framed seat fully surrounds the child providing comfort and the sturdy door-frame clamp provides a secure fit in most interior doorways. Parents can feel comfortable knowing their child is protected by a fully-enclosed spring that prevents the child from touching the spring. Because this doorway jumper is easily packed, it is also great to take on the road for playtime anywhere and it's easy to wipe clean when you're finished using it. Evenflo Doorway Jumper, Marianna: Fits standard doorways that are 3" to 6" thick with firmly affixed door trim at least 1/2" wide Jumping promotes fun. AN. Evenflo Exersaucer Door Jumper, Marianna. Parents can feel comfortable knowing their child is protected by a fully-enclosed spring that prevents the child from touching the spring. You can stop searching! Baby Doorway Jumper Play Exercise Toddler Jumping Toys Activity Center Bumbly The Bumbly Evenflo Johnny Jump Up doorway jumper stimulates baby through jumping fun. 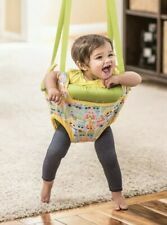 The Bumbly Evenflo Johnny Jump Up provides entertainment and exercise for baby without taking up all your floor space. The framed seat fully surrounds your child, providing comfort. The sturdy door frame clamp provides a secure fit in most interior doorways. You'll feel comfortable knowing that your child is protected by a fully enclosed spring that prevents him from touching the active spring. Because this Evenflo Doorway Jumper is easily packed, it's great to take on the road for playtime anywhere. The Evenflo Doorway Jumper is also easy to wipe clean when you're finished using it. Evenflo ExerSaucer Doorway Jumper, Bumbly Baby Baby Activities G.
A bonus plush toy is hidden in Roo‚ front pouch! Evenflo ExerSaucer Doorway Jumper, Roo. We do our best to process as quickly as possible. Parents can feel comfortable knowing their child is protected by a fully-enclosed spring that prevents the child from touching the spring. Portable;Gender:Girls. Fully enclosed spring. We stand behind our products. This doorway jumper stimulates baby through jumping fun. Parents can feel comfortable knowing their child is protected by a fully-enclosed spring that prevents the child from touching the spring. Evenflo ExerSaucer?. ExerSaucer Joey Jump Up Doorway Jumper. Both parent and child will benefit from ExerSaucer's Joey Jump Up Doorway Jumper. Babies love to move and can be happily occupied for long periods if free to jump. Color:Marianna Entertainment and exercise for baby this doorway jumper stimulates baby through jumping fun. It provides entertainment and exercise for baby without taking up all your floor space. The framed seat fully surrounds the child providing comfort and the sturdy door-frame clamp provides a secure fit in most interior doorways. Parents can feel comfortable knowing their child is protected by a fully-enclosed. Evenflo Exersaucer Door Jumper, Owl. Parents can feel comfortable knowing their child is protected by a fully-enclosed spring that prevents the child from touching the spring. Cleaning instructions: Machine wash seat - cold water, delicate cycle, line dry. The Evenflo Joey Jump Up stimulates baby through jumping fun. Parents can feel comfortable knowing their child is protected by a fully-enclosed spring that prevents the child from touching the spring.